The Sparkle Girl: Oh You Chunky huh, oh You Chunky huh? For any girl who's ever said "ew" to a chunky heel, is probably feeling pretty stupid right about now. The trend is inescapable these days. We've seen the look on celebrities, to stylists, the runway and galore! The term 'chunky' refers to the build of the shoes, specifically meaning 'bulky and solid'. The shoes are coming in all shapes and sizes and lots of brands and designers have embraced the retro feel of the heels. Sure they seem daunting at first, but they're so awesome, you won't regret it. I myself have been a fan of this style for shoes for years. I remember when a roommate of mine couple of years back straight out denied acceptance of the trend and told me how much she disliked the ones I was wearing. The ones I had wore that time were Vince Camuto's shaped like #7 with a wooden heel and metallic straps. (I wonder how she feel's about the chunky heels now ;). hehe Love you roomie). The shoes are major head-turners. I love pairing mine with a great slim pant or cropped pants. They go perfect with accordion skirts and other dresses too. This style of shoe can be worn through all seasons. A chunky heel can give your outfit that extra 'oomf' you're searching for to complete your ensemble. There is no wrong or right way to wear this style of shoe. But make sure the shoe you're picking out for yourself doesn't take away from other aspects of your outfit or your personality. One far too many times I've seen girls over-do-it with the chunky heels. Choose a shoe that you know you're going to love. Don't just buy it because it looks trendy, but really purchase it if you know it's the perfect accessory. 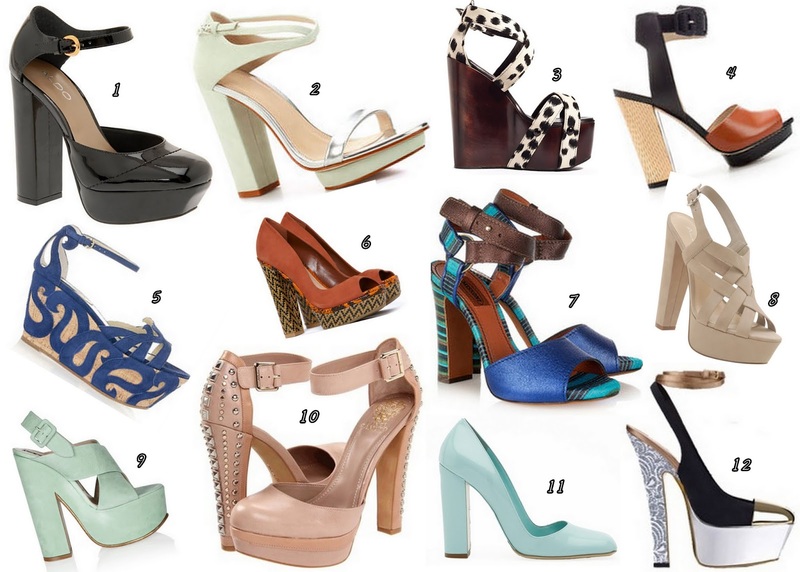 Choose a chunky heel that you know will suit your personality. The brand/designer doesn't really matter, but make sure before purchasing that you can walk around COMFORTABLY in them. The last thing you want to do is fall down on your first walk in the new shoes. Haha! Loving the title of this post! I still don't own a pair of chunky heels, but I'm dying to, esp after this post! Again, thanks for keeping me in the loop, SG! I love this kind of shoes because they are the only type of high heels I can only wear! I bought an Asos pair of Mary Janes for a wedding and everybody thought that my shoes were super cute and original! Although I must admit I couldn't stand on those 10 cm for the whole day and I had to swap them eventually for a pair of ballet flats :P . By the way, I’ve just discovered your blog and I really like it. Would you like to follow each other via GFC? Please, let me know! I love this post! Especially the title!! love these choices! the 6th pair is my fave!